I have a vague memory of my dad describing how he had to carve his own pens out of bamboo in order to have a writing implement in elementary school. Of course, this may be the Punjabi version of, “When I was your age, I had to walk 5 miles in snow to get to school,” but even if so, ink pens have been a part of my family’s culture for as long as I can remember. 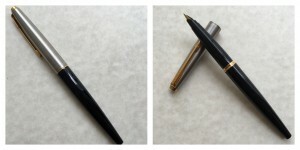 Not my Dad’s pen, but the same model, in a later edition and different color. When I was growing up, the fountain pen my dad wrote with took on an iconic significance for me. It was by Parker, and had a brushed steel cap and a rich teal body. (In later years, I did some research and found it to be the Parker 45.) My father had a distinctive handwriting, and the pen seemed to lend a mysterious power to everything he wrote. We didn’t have ink pens in school in Pennsylvania when I was growing up, neither fountain pen nor carved bamboo, but nostalgia came to me in early childhood, as the idea of the ink pen reminded me of my dad, and my cousins in India, a parallel world where you could hand pump water out of a well in the school yard and intentional writing with live ink was a value and a necessity. In the early days, I cut feathers abandoned in the backyard to make quill pens. This was not as elegant as it looked in the portrayals of colonial statesmen we studied in school. 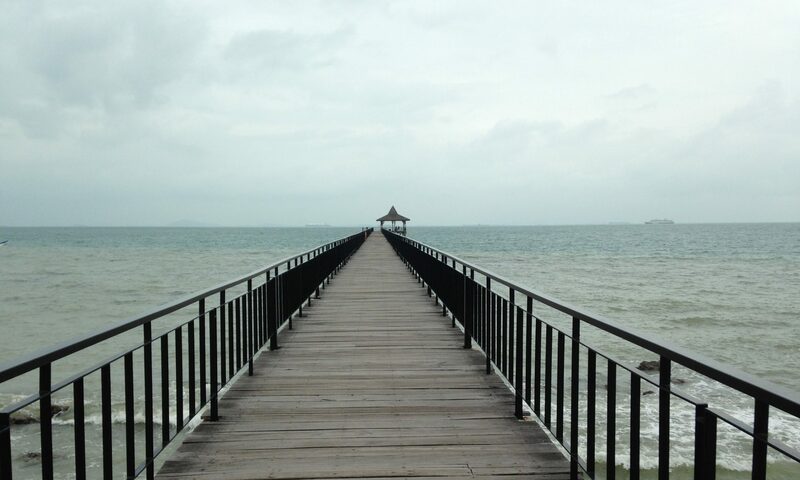 The response of the feather against the page was scratchy, the marks blotchy, and the ink supply short. In retrospect, I’m not sure the bird hygiene was a great factor, either. I’d always wanted to write with that pen of my Dad’s, and finally he got one for each me and my sister. Within a week or two, I promptly dropped mine on its nose and destroyed it. I remember the look on my dad’s face when I told him. It was about the same as when I told him I wasn’t sure I believed in God. I thought there would be another pen forthcoming to replace it, but there wasn’t. That was it. It was some years before I got another opportunity. Perhaps by 14 I finally got my second chance at a real fountain pen with a cheap Sheaffer that I used throughout our next trip to India. It was solid brushed steel, a thin cylinder with no taper, and I loved the little white dot that defined the brand and the sleek parallels of the clip. 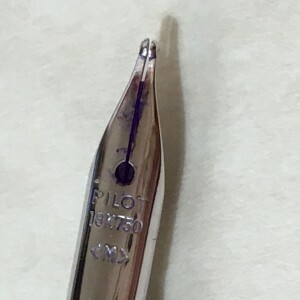 The click of its cap was solid and satisfying, and the flow of ink through its nib onto the paper, smooth and lustrous. I loved the slow liquid indulgence of forming each word, each letter like an individual painting. My first fountain pen as an adult was a Lamy Safari in the original charcoal edition. I wasn’t sure about it at first, because it looked chunky and businessman-like to me. I’ve since learned that in its brighter colors, it was the official, compulsory pen of some school children in Germany, and that they couldn’t wait to graduate elementary school to escape it! THE pen for German schoolchildren! Nevertheless, although I had my doubts about the Safari in the beginning, it grew on me quickly, and even my cousin Pali in India admired it, and I left that original with him and replaced it when I got back to the States. The Goulet Pen Company: More than just an online retailer for fountain pens and inks, Brian and Rachel Goulet and their now-full staff of fountain pen enthusiasts have made it their mission to not only bring fountain pens back into daily use, but to support fountain pen lovers and any interested with their blog, and their ever growing wealth of educational resources about fountain pens (Anatomy of a Fountain Pen, Fountain Pen 101, Glossary.) I personally credit them entirely with the rejuvenation of the fountain pen in American life. I also feel they set the business standard that all other pen retailers have to constantly chase in an effort to catch up. And here are some of my recommendations for starter fountain pens. Ultra Cheap ($3): Platinum Preppy – School-pen attractive in bright colors, this pen provides disposable carelessness with the educational value of a demonstrator pen (see-through) and a large ink capacity. Nib smoothness is adequate in general – and excellent for the price range. 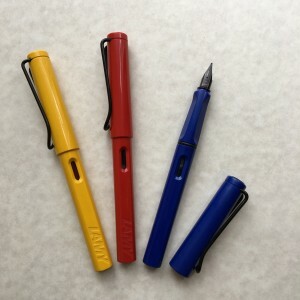 Inexpensive Midrange ($30-40): the beloved Lamy Safari and Lamy Al-Star – superior (and interchangeable) nibs for the price range, many attractive colors to choose from. Warning: the Limited Editions and Special Editions colors can be a danger for people prone to collecting. I hope you enjoyed this little love story to fountain pens, and if you are not a fountain pen lover yet, I hope you’ll explore further and try them out. Please leave your fountain pen stories and memories in the comments. Thanks so much for mentioning me and my store Kiran, you say such nice things 🙂 thanks for sharing your thoughts with us, I really agree on your pen choices. To add my $.02 the Pilot Varsity and Pilot Metropolitan are two other starter pens worth checking out. Loved this post. I’m partial to fountain pens myself. I always thought they were the mark of a “true” writer. Years ago, my boss gave me a small bonus and told me to spend it on something completely frivolous and meaningful to me. I bought a gorgeous Phileas Waterman fountain pen with a gold nib. I still love writing with that pen, and always use a fountain pen when journaling. Next PostNext The Journal: Vehicle to the Past or Future?